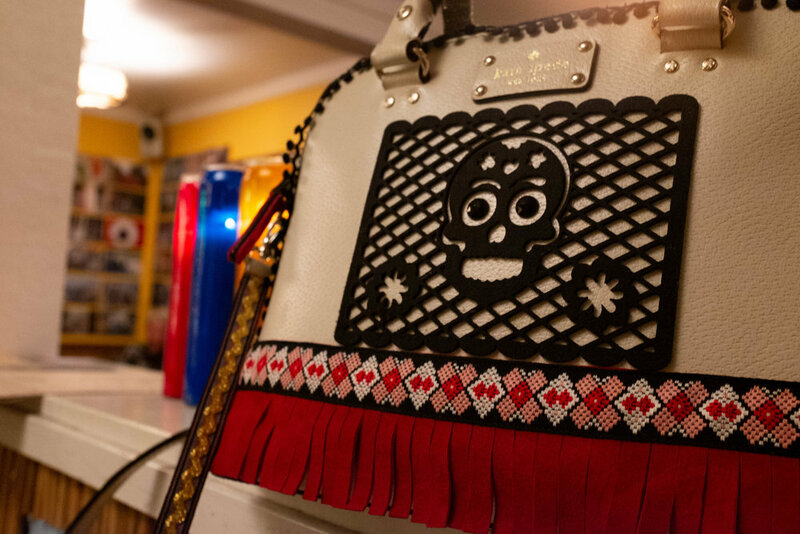 We reimagined one of Spade's classic handbags by incorporating concepts from Dia de los Muertos. With the recent passing of beloved fashion icon Kate Spade, Rachael began thinking more about life, death, and how to celebrate Spade’s life in her work. 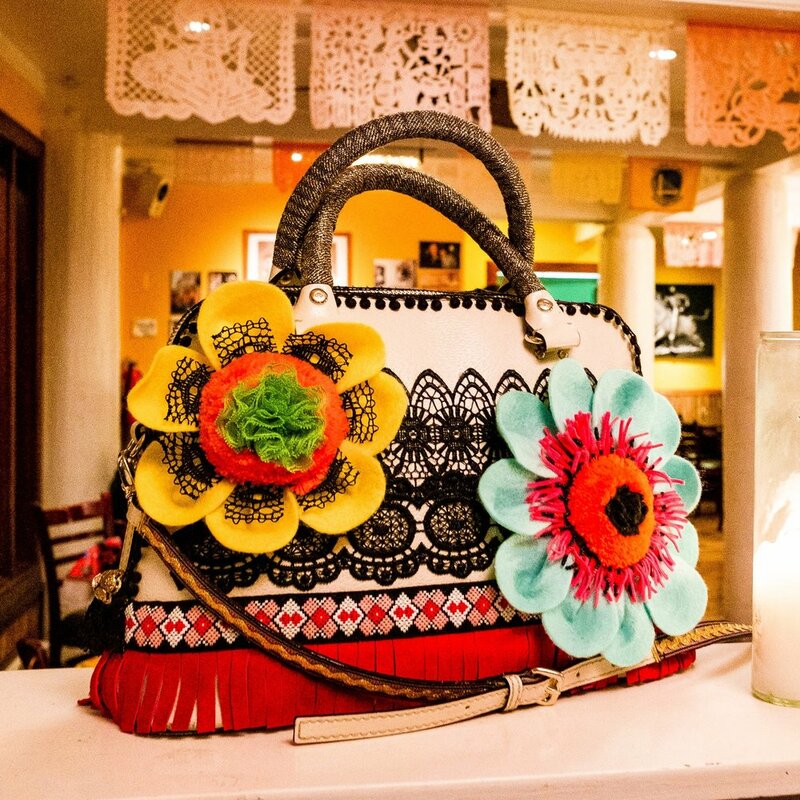 She decided that the best way to do this was by incorporating concepts from Dia de los Muertos into a reimagining of one of Spade’s classic handbags. Why Dia de los Muertos? Growing up in California’s Central Valley, it was a well loved tradition to celebrate Dia de los Muertos with family, friends, and community. She has always loved the beautiful and vibrant imagery of the celebrations - papel picado flags floating on the breeze, faces masked in colorful sugar skulls, bowl upon bowl of colorful marigolds, and breathtaking altars to celebrate those loved and lost. When gathered for this holiday, it is a meaningful festival full of reverence and joy all rolled together. The entire experience of Dia de los Muertos is loud, colorful, intoxicating, and can also be wonderfully garish. Rachael wanted to create that feeling with her bag, so she picked a simple neutral white bag to be a blank canvas to build on. When thinking of imagery to use, she decided on two central themes to build her design around, the picado flag and traditional rosette flowers. The papel picado flag in her design was created out of felt scraps, laser cut. When applied to the panel of the bag, the open lattice design allows the underlying materials and design to be seen while the flag provides added depth to the bag. Brightly colored marigolds, traditionally believed to help guide the spirits, became the center for her flower rosettes. By creating this design focusing on the cycle of life and death, Rachael hopes to both celebrate the spirit of Kate Spade, as well as create commentary on how textiles that have reached the end of their original lifetime can gain new meaning and value by becoming new creations. It is her intention to facilitate a conversation about how objects that are often considered ugly or lacking in value can be repurposed and reincarnated with new meaning and beauty.